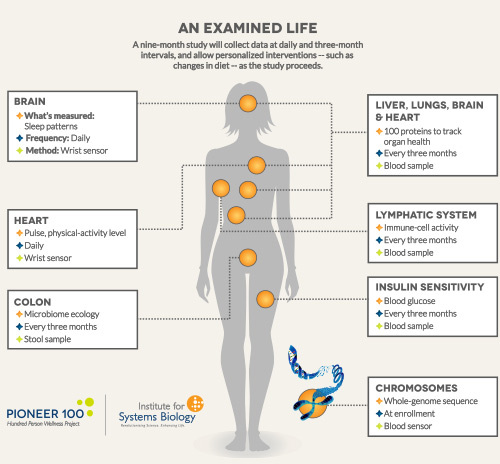 The Institute for Systems Biology has presented this overview of the Hundred Person Wellness Project. 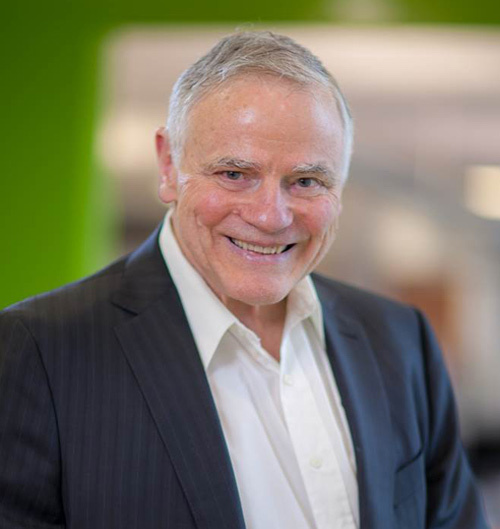 Leroy Hood M.D., Ph.D. Dr.
A new study could revolutionize medicine by allowing researchers to predict and prevent diseases. We believe that a longitudinal, Framingham-like study of 100,000 well individuals (hereafter termed the 100K project) and their dynamical data clouds could transform medicine by 1) providing scientifically validated metrics for wellness, 2) allowing one to study the earliest origins of disease in an individual and 3) allow one to follow the entire progression of a disease from its beginning to end. This proposal would allow us to study the initiation and progression of all common diseases and, from that, learning how to predict and prevent these diseases would revolutionize healthcare. Contemporary medicine is challenged by the incredible complexity of physiology and disease. Each individual has unique genetic and environmental contexts. Clearly the traditional reductionist approaches to disease are insufficient to effectively deconvolute this complexity. Over the last 10 years systems approaches have increasingly been employed, leading to a new discipline designated systems medicine, which has two striking features. First, each patient will be surrounded by a virtual cloud of billions of data points, and we will have the analytical tools to reduce this enormous dimensionality to simple hypotheses of how to optimize wellness and minimize disease for each individual. Second, the data can be integrated and modeled to determine the health and disease-associated states of the “network of networks” operating in each individual. These interconnected networks manage diverse types of biological information that operate at the chromosomal, molecular, cellular, organ, and even individual levels. In disease, these networks become perturbed and this alters the information they manage and the functions they carry out. Delineating this altered and disease-perturbed information provides insights into disease mechanisms, diagnostic markers, and drug target candidates. Systems medicine has reached a tipping point and its emerging technologies and systems-driven strategies are already beginning to alter the practice of medical discovery and of healthcare. 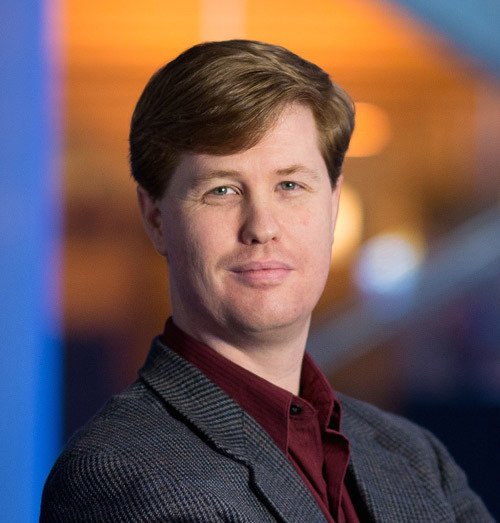 Many strategies are helping to drive this future, such as using the complete genome sequencing of families to more rapidly identify disease genes, studying disease dynamics in model organisms to provide fundamental insights into disease mechanisms, pioneering systems approaches to blood diagnostics to create powerful biomarker panels that can inform medical decisions, stratifying diseases and patients into distinct subgroups for more personalized treatments, and using computational analyses of disease-perturbed networks to identify new classes of drug target candidates. The convergence of systems medicine, big data and its analytics, and patient-activated social networks has led to a medicine that is predictive, preventive, personalized, and participatory—P4 medicine. It differs from traditional evidence-based medicine in six ways: 1) it is proactive; 2) it focuses on the individual patient, 3) it emphasizes wellness; 4) it generates the personalized data clouds that provide fundamental insights into each individual, 5) it notes that the traditional path of clinical trials is ineffective and wasteful, and it suggests that clinical trials start with a deep analysis of the individual and not populations of dissimilar individuals; and 6) it contends that patient-activated social networks will be a major driving force in the medicine of the future. P4 medicine embodies two central concepts—quantifying wellness and demystifying disease. The question is how do we bring P4 medicine to current healthcare systems? We believe the answer to that is through large-scale, information-rich longitudinal studies such as we are launching via the P4 pilot 100K project. The idea is to take 100,000 well patients and then carry out detailed genomic, proteomic, epigenetic, metabolomic, and phenotypic measurements on them four or more times a year—examining blood, saliva, stool as well as other physiological and psychological parameters. After time, these individuals would separate into two classes—those who remained well (or enhanced their health) and those who transitioned into disease. From the data of those individuals who remained well or improved their health we could extract metrics for wellness. We could study those individuals transitioning from wellness to disease at the earliest stages of this transition—deciphering early disease mechanisms and generating early diagnostic markers. In time, the insights gained offer the possibility of transitioning patients very early on from the disease trajectory back to a wellness trajectory, saving the healthcare system enormous dollars by greatly shortening the costly disease trajectory and, most importantly, greatly enhancing the individual’s quality of life. The starting basis will be a whole-genome sequence for each participant in order to have information about the building blocks of each individual’s physiology. This will only need to be done once, but a host of other measures will provide details on the dynamic changes in health that occur over time by interaction with the environment. Thus, we will employ digital devices that continuously measure physiological parameters like heart rate, activity, sleep quality, blood pressure, and weight. We will periodically measure the gut microbiome, clinical chemistries with a focus on nutrition, blood metabolites, organ-specific blood proteins for the brain, heart, and liver (measure general wellness to disease transitions), white blood cell epigenetics, and salivary cortisol levels (stress) four times a year. We are working on new assays to assess more effectively immune responses and inflammation—signal features of many different diseases. It is important that rigorous standards be created both for sample procurement and for assessing each of the individual data types so that the data can be integrated successfully and mined for discovery. We also believe that these data must be shared freely among the groups that are working together to accelerate progress for the patients who need the healthcare advances. These data for each individual will be aggregated, integrated, mined, and models created to help prioritize the actionable opportunities for each individual. Developing the analytics will be one of the largest challenges of this study. An actionable possibility is a feature for an individual that, if corrected, could improve wellness or avoid disease. Let me give two examples. A friend was told that he had early onset osteoporosis in his mid-30s—a disease that potentially could confine him to a wheelchair for the rest of his life. After genetic analysis, he discovered that he had a defective calcium transporter. He took 20 times the normal amount of calcium for several years and returned his bone structure to normal. After about 12 years he continues to remain normal on this regimen. Thus this genetic defect is actionable in that it can be corrected by a vitamin. A second example was a physicist who began to lose interest in his work and had difficulty concentrating and finding the same joy in his life and work as he had previously. After this continued for a considerable time, he began to question whether he should completely change his life trajectory. Upon undergoing blood screening, it turned out that he was strikingly deficient in iron. Within days after replacement therapy he returned to normal and resumed his former life with his typical enthusiasm. In this case the defect was an environmental deficiency that could readily be corrected. We believe the genome has 300–500 actionable genetic variants and many of them lead to nutritional deficiencies. Hence our feeling is that every individual will have multiple actionable possibilities that can be corrected. An important point is that new actionable possibilities will be revealed as we integrate together different combinations of data. We plan to have coaches that can take these actionable possibilities and explain them to the individuals, hopefully, in such a manner that the individuals will be moved to act upon their actionable possibilities. Of course, physician oversight and treatment would be triggered following established practices whenever such needs arose. We started in March 2014 with the first 100 participants in this program—the so-called 100 Pioneers. After nine months we plan to assess the program (how complete are the datasets, how many actionable possibilities did we identify for each pioneer, how many pioneers acted upon their actionable possibilities, how enthusiastic were the pioneers at the study’s end, which assays were most effective in identifying actionable possibilities, etc.). We will then move to a program with 1,000 individuals, then 10,000 individuals and finally to 100,000 individuals. We will recruit a variety of strategic partners to provide patients/participants for this effort—technology companies for their employees, forward thinking clinical centers, insurance companies and payers for their clients, large longitudinal clinical studies, consumers, etc. We have already been approached by six different foreign countries expressing an interest in the 100K wellness program. It will also be important to engage federal funding agencies in supporting this program—NIH, NSF, DOD, NIST—and these efforts have begun. The 100K project will create metrics for wellness, permit a study of the earliest origins of disease, and enable one to follow the progression of disease from beginning to end—all in humans. These efforts will improve the quality of healthcare, eventually decrease its cost, and promote a cycle of innovation and company formation. We predict that from these studies a wellness industry will emerge that could exceed in market cap the “disease industry” in the next 10–15 years. The 100K project embodies all of the fundamental features of P4 medicine and we think it will be the wedge that could bring P4 medicine to contemporary healthcare. Clearly the bold organizations that embrace P4 medicine will be at the leading edge of the coming revolution in healthcare. This project will lead to improved healthcare practices and decreased healthcare costs. For more on the project, be sure to check out the video “The 100K Wellness Project“. Leroy Hood, M.D., Ph.D., is president and Nathan D. Price, Ph.D., is associate director of the Institute for Systems Biology. This article was originally published in the May 15 issue of Clinical OMICs. For more content like this and details on how to get a free subscription to this new digital publication, go to www.clinicalomics.com.